'Secret Weapons' is evolving nicely and writer Eric Heisserer is doing it with great character development turning these so-called superhero rejects into resourceful underdogs. One of the sure-fire ways to endear characters to readers is to make them "loveable losers." Underappreciated and underestimated, these psiots with odd powers who were rejected from Harada's psiot-inducing factory, are just normal kids willing to do the right thing. 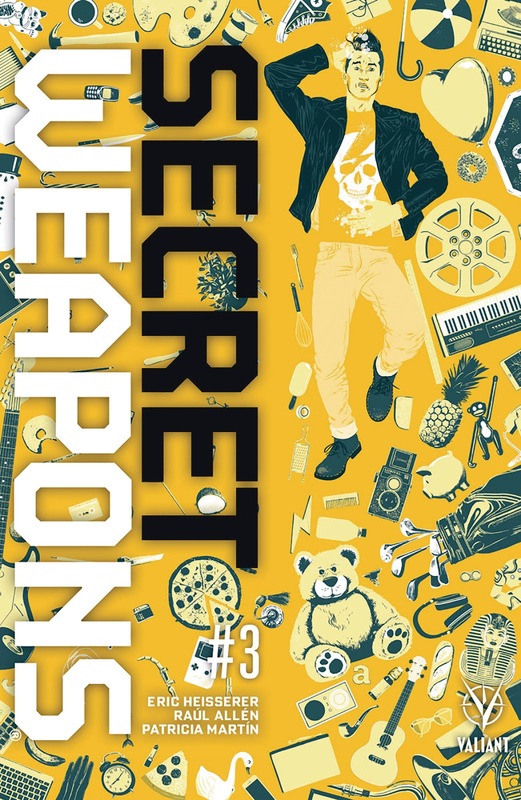 Like any tale of underdogs rising to the occasion to make their mark, 'Secret Weapons' embraces this trope and in doing so delivers a charming and exciting superhero comic. At the center is Amanda Mckee-the super-powered technopath known as Livewire, who mentors her recruits. She's the Professor X to her X-Men wannabes who just need a vote of confidence and some responsibility. In many ways, the themes are reminiscent of the legendary Marvel series that served as an allegory for society's ills like discrimination, something that is cleverly covered in the opening scene. And like those gifted mutants, McKee's psiots need to come together and learn to use their powers as a team. Unlike Harada, she sees their value and worthy of her protection. In this world where even the most common third tier psiot is being hunted by a cybernetic threat known as Rex-O, the parallels to our current immigration enforcement policy targeting the most vulnerable among us resonate sharply. Avichal's power to become solid as stone but stationary comes in handy as he explains in the opening. He's a Sikh and is mistaken for Muslim which draws looks and stares from people seemingly all the time. The discrimination he encounters is compounded by the distrust the public has of psiots as well. The confrontation we see is one we've seen too often in real life. Heisserer taps into that narrative with a good outcome for Avichala which is rousing but a reminder it doesn't end well for everybody. Nonetheless, Heisserer takes these bold steps to highlight the dangers the psiots face not just from Rex-O but from everyday life. In doing so, 'Secret Weapons' takes on a deeper meaning, a more urgent and timely social aspect that is all too familiar in our present climate. The social commentary is woven into a larger conspiracy that threatens these heroes-in-training. It's still a superhero comic with all the thrills and action you'd expect but with some surprising results from from some unlikely heroes. 'Secret Weapons’ doesn't sacrifice character development for great action. It does both well and makes us care about this ragtag team of rejects that have unlimited potential. The subversive social commentary and the rise of the underdog are not new to comics but rarely executed this well. It feels like Heisserer and company are just getting started with this penultimate chapter and it really deserves an ongoing series of its own. Valiant Entertainment keeps producing winning comics and without a doubt 'Secret Weapons' is a clear winner.